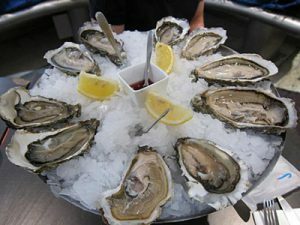 There are countless Parisian destinations that provide the highest-quality French food items and cooking products—even for us amateur home chefs—including G. Detou, Hediard, Fauchon, La Grande Epicerie de Paris at Le Bon Marche and scores of smaller specialty shops and boutiques throughout the City of Light. 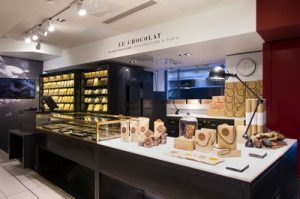 But one epicurean destination I keep returning to time and time again is Lafayette Gourmet, the high-end food hall operated by the venerable Galeries Lafayette department store on the Boulevard Haussmann. And it’s because I not only find an incredible array of delicious, freshly prepared gourmet foods that I can savor right away—including all the makings for an epic picnic—but also can choose from a wide selection of France’s most prestigious gastronomic brands that I can bring home to enjoy later or to give as unique Parisian gifts. Foie gras? Check. French chocolates? Certainly. Macarons? Most definitely. Wine? Duck confit? Pate? Vinegars? Mustards? Teas? Jams and confit? Absolutement. You name it, and they’ve probably got it somewhere in those rows upon rows of delicious edibles. One could spend hours just browsing. It’s a literal feast, both for the eyes and stomach. And best of all, the shop was moved to impressive new digs a year and a half ago that nearly doubled its floor space. 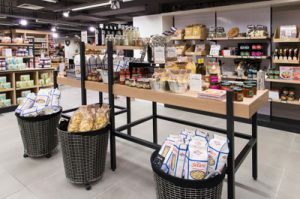 In September 2014, the gourmet emporium relocated from the basement of Galeries Lafayette’s Men’s Store across the street to two entire floors of the Lafayette Maison and Gourmet Store. Not only did the move give Lafayette Gourmet much more room (3,500 square meters) to add new items and expand a several “tasting bars” (mini-cafes serving up a limited number of high-end small dishes), but more logically situated the food hall among the department store’s culinary and housewares sections. Now, the ground floor of the building houses fresh meats, fish and produce, as well as scores of prepared dishes and prepackaged foods; the second level is home to sweets, breads, chocolates and coffee, as well as hundreds of other items; the third floor offers an array of cooking and kitchen fare, as well Galeries Lafayette’s wine shop; the fourth floor is home to tableware and an Alain Ducasse (one of the world’s most renowned chefs) cooking school; while the top level offers bed and bath linens. Even if you’re not on the prowl for grocery purchases, Lafayette Gourmet makes an excellent lunch spot. Arrive early to grab a seat at one of the tasting bars, including: Mavronmmatis for Mediterranean fare; a kiosk offering Petrossian caviar, salmon and foie gras; Fish Point for fresh seafood and its renowned oyster bar; Salumeria Rosi for fine Italian smoked meats and sausages; Café Cuillier for pastries, quiches and coffee; 5 Jotas, which specializes in Iberian ham; and Steak Point, which offers high-end burgers and steak tartare. And Paris visitors: Hang onto your receipts. 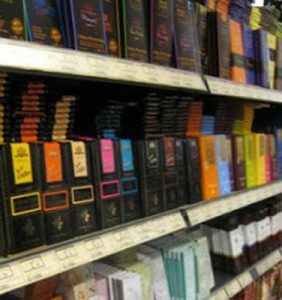 Except for its on-site eateries, Lafayette Gourmet is duty-free for non-EU residents. Lafayette Gourmet is located at 35 Boulevard Haussmann (Metro: Havre-Caumartin). The store is open 8:30 a.m.-9:30 p.m. Monday-Saturday, although most of the tasting bars open later and close earlier, each according to their own schedules. Closed Sundays. 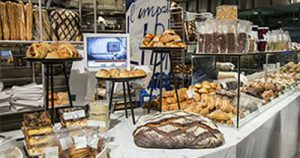 This entry was posted in Culinary Supplies, Food, Right Bank, Shopping and tagged Alain Ducasse, Boulevard Haussmann, Galeries Lafayette, Lafayette Gourmet by Bob Adams. Bookmark the permalink.